Why is it that the normal diet is three meals a day plus snacks? . . . There are a lot of pressures to have that eating pattern, there’s a lot of money involved. The food industry – are they going to make money from skipping breakfast like I did today? No, they’re going to lose money. If people fast, the food industry loses money. What about the pharmaceutical industries? What if people do some intermittent fasting, exercise periodically and are very healthy? Is the pharmaceutical industry going to make any money on healthy people? The quote above comes from a TED talk Mattson gave on the benefits of fasting, a practice which forces the body to switch its fuel source from glucose to ketones. Scientists are observing a wide variety of health benefits from this transition, from starving cancer to improving cognition, and a ketosis diet is now being implemented for people with cancer, Alzheimer’s disease, epilepsy, and more. It has tremendous benefits for the brain, as explained by Mattson in his talk, but also for the body. The human body only has two fuel sources, fat and glycogen (sugar). When we have a lot of sugar stored in the body (from consuming carbohydrates, for example, which turn into sugar), our body uses that sugar to feed our brain and other organs, providing the energy they need to function. When the body runs out of glucose, it switches energy sources, from glycogen to fat. This can only happen when the body is depleted of its glycogen reserves. We’ve been taught for years that the body needs glycogen to operate properly, but as we continue to expand our knowledge, it turns out this might not be the case. When the body is done running on glycogen, and starts burning its fat reserves, it also produces what are called ketone bodies. These are molecules that are produced by the liver from fatty acids during periods of starvation, fasting, low food intake, carbohydrate restrictive/high fat diets, and long, intense exercise. As it turns out, these ketone bodies have a wide range of health benefits. In 1923, scientist Otto Warburg hypothesized that cancer was caused by a metabolic process whereby cancer cells fuel their growth “by swallowing up enormous amounts of glucose (blood sugar) and breaking it down without oxygen.” Coined the Warburg Effect, the theory was controversial at the time, but the past few decades have sparked new interest in it, and oncologists now use the dependence on glucose that cancer cells have to locate tumours within a patient’s body. Warburg made his discovery around the same time the ketogenic diet was found to be beneficial for epilepsy. Studies have shown that when the body produces ketones, they form a protective barrier around the brain, which is why more and more paediatricians are recommending the diet for children with epilepsy. It has a huge success rate, yet, since fasting is neither marketable nor profitable, receives little mainstream attention. The ketogenic diet incorporates a high fat, low protein, low carbohydrate intake that forces the body into starvation mode. As a result, glucose becomes depleted and the body is forced to produce a new source of energy, one cancer cells cannot feed off. Nutritional manipulation of the body can actually starve tumour cells while maintaining its other tissues by creating protective compensatory mechanisms. That being said, you can still induce high ketone levels by doing a lot of fasting, and eating healthy, even if you are eating carbs. During your fasting periods, you will still be producing ketones. You can actually measure your blood ketone levels, and you can find out more about that below. A few years ago, scientists discovered the first evidence of a natural intervention triggering stem cell-based regeneration of an organ or system. The study was published in the June 5 issue of Cell Stem Cell by researchers from the University of Southern California. The research shows that cycles of prolonged fasting protect against immune system damage and induce immune system regeneration. They concluded that fasting shifts stem cells from a dormant state to a state of self-renewal. The study outlines how, during periods of fasting, the body repairs damaged DNA and helps to starve cancer. Caloric restriction (CR) is currently the most robust environmental intervention known to increase healthy life and prolong lifespan in several models, from yeast to mice. Although the protective effect of CR on the incidence of cancer is well established, its impact on tumor cell responses to chemotherapeutic treatment is currently being investigated. Interestingly, the molecular mechanisms required to extend lifespan upon reduced food intake are being evaluated, and these mechanisms may offer new opportunities for therapeutic intervention. In addition, new findings suggest a beneficial effect of CR in enhancing the efficiency of tumor cell killing by chemotherapeutic drugs and inducing an anticancer immune response. By fasting, you’re literally cutting off the energy source for cancer cells, and at the same time, while in ketosis, your body is experiencing a wide range of other health benefits. 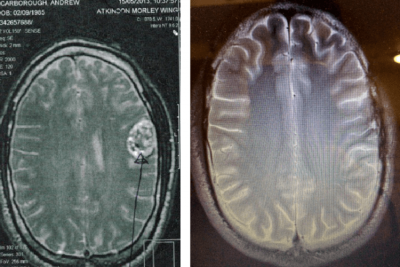 The first publication tested on a case by case basis in this area was done in 1995, when two young patients received ketogenic diet therapy for their brain tumours. They were unresponsive to standard treatments, yet with this new therapy, both patients’ tumours began consuming less glucose and shrinking in size. In 2010, a case report was conducted on a 65-year-old woman who had a brain tumour causing numerous neurological deficits. In addition to standard care, she was put on a ketogenic diet. After two months, she experienced a complete remission of her tumour, yet when the diet was suspended, the tumour returned. Below is a talk between Joe Rogan and Dr. Dom D’Agostino, Ph.D., an assistant professor in the Department of Molecular Pharmacology and Physiology at the University of South Florida Morsani College of Medicine and a Senior Research Scientist at the Institute for Human and Machine Cognition (IHMC). D’Agostino discusses what we know about the ketogenic diet today. He recently published a study showing the benefits the diet can have on cancer cells. Here is a 13 minute TEDx talk that’s also pretty informative if you don’t want to listen to the whole podcast below. Here is an episode of a doctor sharing a different perspective.